QUEBEC – Monarques Gold Corp. of Montreal has received a positive feasibility study for its 100% owned Wasamac gold project 15 km west of Rouyn-Noranda. The study concludes that the underground mine will produce an annual average of 142,000 oz. of gold over a life of 11 years. According to the feasibility study, Wasamac has an after tax net present value (5% discount) of $311.1 million, an internal rate of return of 18.5%, and a payback period of 3.9 years. All-in sustaining costs are estimated at $826/oz. (US$630). Pre-production capex will be $464 million, which includes $230 million to build a mill and tailings management area. Plant construction could begin by the end of 2020, and commissioning could happen in the first half of 2022. Monarques is also studying the possibility of custom milling the ore from Wasamac at its Camflo or Beacon facility. The proven and probable reserves are 21.5 million tonnes at 2.56 g/t gold and containing 1.77 million oz. The reserves are included in 29.9 million measured and indicated tonnes grading 2.70 g/t gold and containing 2.59 million oz. The inferred resource is 4.2 million tonnes at 2.20 g/t and containing 293,900 oz. of gold. 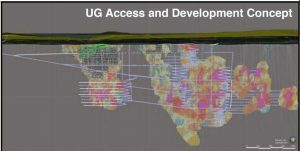 The December 2018 feasibility study is posted at www.MonarquesGold.com.